These easy Valentines Treat Bags make the perfect little gift for friends, neighbors, or family this Valentine's Day. Grab the FREE printable bag toppers, add a few sweet treats or small toys and you have a sweet and thoughtful Valentine to gift for anyone on your list! Valentine's Day was always fun to celebrate as a kid. Book work was pushed aside as our class played Valentine's themed games, ate valentines treats, and passed out Valentines to fellow classmates. Fast forward to our first year of our homeschool co-op and I didn't plan anything. Yup, #momfail! Year two, I knew better and went above and beyond by MAKING valentines treat bags my kiddos could pass out to their friends. Luckily for you, I am sharing the treat bag toppers I made for you to use, too! 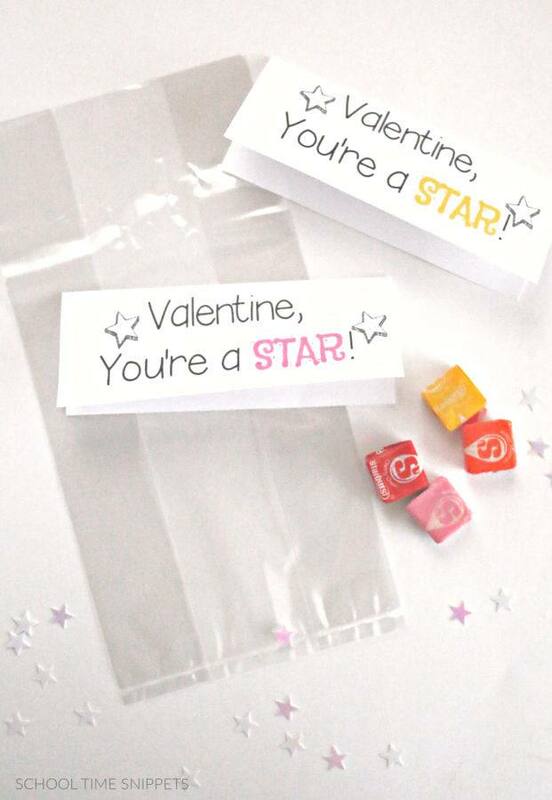 These printable "You're A Star" treat bag toppers make these Valentine's treat bags super simple to make! Grab a few materials, a valentines treat, and print the treat bag toppers for an easy Valentines treat bag. 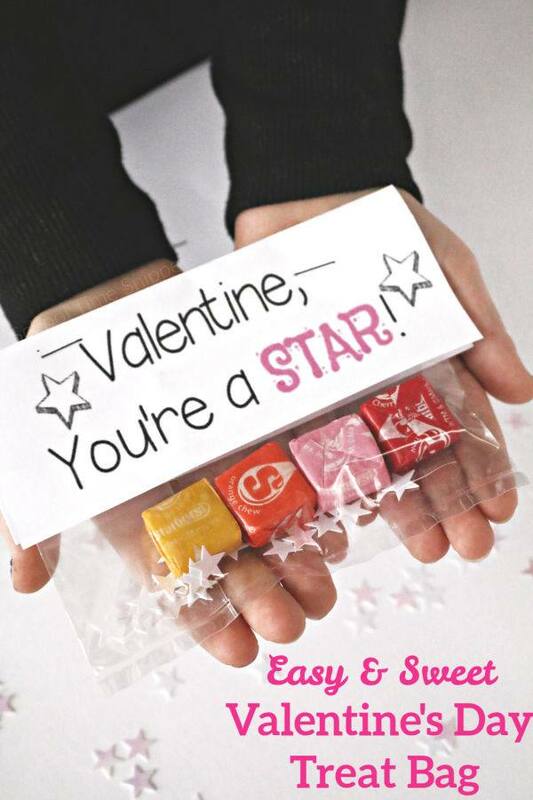 These "Valentine, You're a Star" treat bag toppers are versatile for boys and/or girls. Friendly and sweet, but not over the top mushy, ya know what I mean?! Print out the treat bag toppers. There are four toppers, so print out as many pages you need for the number of kids you are giving them to. Grab enough cellophane bags, scissors, and stapler. Cut apart the bag toppers. To assemble the treat bags, fill the cellophane bag with your desired treat. Cut 1/2- 3/4 of the bag. Take a teat bag topper and fold it in half. Place it over the bag and staple both ends in place. OH! One more thing, simply have your child write his/her name on the back of the treat bag topper to share who gave them this Valentine's Day Treat Bag! My daughter has her own name stamp , and so she just quickly stamped the back of each treat bag and they were ready to be passed out! We made sure we had enough (+ a few extra just in case) for each child in her co-op class, so we didn't fuss with writing names out. THAT saves time!! 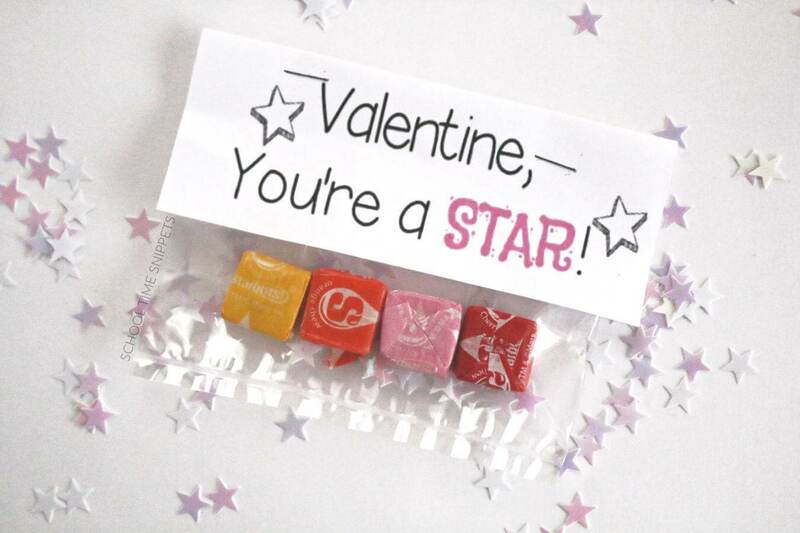 Inside each treat bag, we chose to put a few starburst candy and star confetti. My kiddos were so excited to pass these out last Valentine's Day! These Valentine's Treat Bags came together pretty fast-- they were simple to put together and are versatile to what you can/want to fill the treat bag with! By entering your email, you will be added to our mailing list! See our disclosure for more info!